With revenue of $4 billion-$4.5 billion, sales of legal recreational and medical marijuana in 2016 topped those of Viagra and Cialis, paid music streaming services, tequila and Girl Scout Cookies. It’s a notable milestone for an industry still very much in its infancy. The data – published in the newly released Marijuana Business Factbook 2017 – illustrate how quickly the legal marijuana industry has grown. It now rivals the retail market for traditional consumables like frozen pizza and ice cream. And by the end of this year, sales of legal cannabis will likely overtake both of those goods with expected increases of 28%-35% that will hike revenue to $5.1 billion-$6.1 billion in 2017. Driven by the wave of legalization initiatives that swept across the United States in 2016, medical and recreational cannabis markets will continue to grow at a robust rate for the foreseeable future. For example, large adult-use programs in states like California and Massachusetts – as well as Florida’s massive MMJ market – should be fully operational by 2018. In just a few years, revenue generated from the legal cannabis industry could eclipse that of all movie ticket sales in the United States and Canada, with sales projected to hit $10.1 billion-$13.7 billion by 2020. But legal sales are a mere drop in the bucket relative to the estimated total demand for legal and black market cannabis in the United States, which currently stands at roughly $45 billion-$50 billion annually. That’s how much revenue the industry eventually could generate if the federal government legalized cannabis tomorrow and every state allowed sales. However, sales should likely rise even more as consumers become increasingly familiar with the industry and more accepting of cannabis use. That phenomenon currently is on display in Colorado and Washington state, where recreational sales are continuing to surge years after the programs launched. Eventually, retail marijuana sales could rival that of similar goods like cigarettes and beer. Alcohol companies have already recognized the nascent marijuana industry as a threat to their existing business. The parent companies of Sam Adams beer and Jack Daniels whiskey, in their latest annual SEC filings, cited rising marijuana use as a shift in consumer preferences with the potential to adversely affect sales. 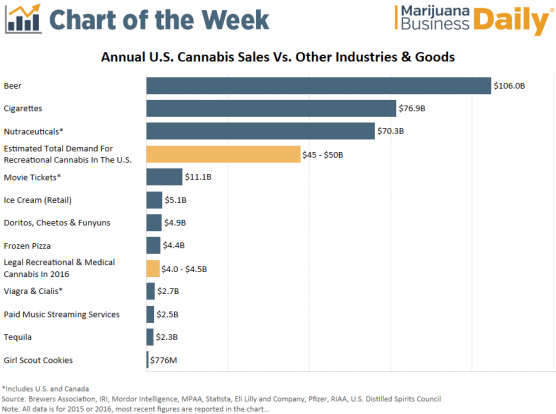 Though many have yet to recognize cannabis as a legitimate industry, the numbers leave little room for interpretation: Marijuana is an economic force with tremendous potential for long-term growth. Great to see the flesh removed from this issue for a change. The ‘Bare-Bones’ of the dollar-Potentials is the Batna for everyone to take-away from this . What a euphoric way to be entering Our Future eH !